Posted by Eddie & filed under Mountains & hills, Science, October 11 2012. For several years now, there has been a secretive and remote location in the Scottish mountains that I have been trying to get to. 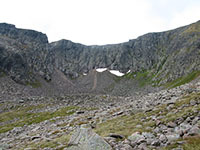 This location is Garbh Choire Mòr, a corrie at the western end of the larger An Garbh Choire in the Cairngorm mountains, between Braeriach and Cairn Toul, and it is notable because it holds the most persistent snowpatches in the Scottish mountains (see my website pages about perennial snowpatches in the Scottish mountains here). The corrie is perhaps the most inaccessible non-climbing location in the whole of the British Isles. I have tried to reach the location on several previous attempts but the corrie is located in the heart of the Cairngorm mountains many kilometres from any roads, and is surrounded on its north, west and south sides by steep and bouldery ground. It is possible to descend into the corrie from the north, at a point just east of Carn na Criche (OS 10-figure grid ref. NN 94160 98316), and from the south down the Corrie of the Chokestone Gully (OS grid ref. NN 948 976), but these are rocky and steep scrambling routes that require a bit of nerve. 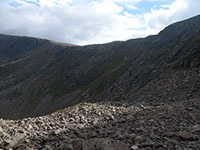 The approach from the Lairig Ghru in the east has no steep ground but necessitates a long walk over pathless and difficult terrain. There is a relatively short window in the year in which visiting the corrie to examine the snowpatches is possible. To examine them when they are at their smallest, and hence most interesting in terms of gauging their persistence and appearance, it is necessary to visit as late in the year as possible. However, this cannot be too late in the year as once they are covered by snow they cannot be seen. As all approaches to the site are long and difficult, then any visit (unless this involves a two-day trip and an overnight wild camp) must also be before the length of the daylight gets too short. This means that the optimum time for a visit is in autumn, in the second half of September. Three weeks ago on September 23rd, I finally succeeded in reaching the location. I started at Linn of Dee at 8am, with the sun not long risen and the air very cold, and cycled the 7km through Glen Lui to Gleann Laoigh Bheag. From there I walked to Glen Dee and the Lairig Ghru path, past the impressive vistas of Glen Geusachan and The Devil’s Point, to the entrance to An Garbh Choire. At this point, I left the relatively easy terrain of the Lairig Ghru path and headed westwards through boggy, pathless and undulating terrain and into An Garbh Choire and up to the Garbh Choire shelter (see photo to the right). The shelter itself is small and fairly dilapidated, and probably not a place that I would choose to spend the night. Further up An Garbh Choire beyond the refuge the walking becomes easier and there are a few areas of relatively flat and grassy ground at the entrance to Garbh Choire Mòr that would be suitable for wild camping, perhaps a more preferable option if I was to revisit the area in the future. The final approach to the snowpatches themselves is over an extensive boulderfield and then a short steep ascent. I got back to the Linn of Dee just after sunset, 12 hours after I set out, with only about 30 minutes time at the snowpatches to spend examining them and taking photographs. The total round-trip distance was 40km, probably the maximum that can be done in daylight hours at this time of year. 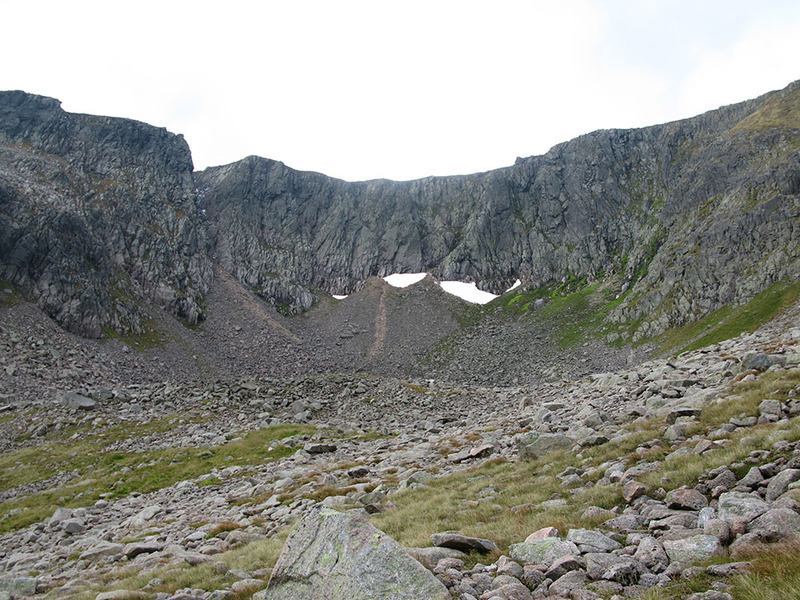 On my visit to Garbh Choire Mòr there were three snowpatches visible high in the corrie, at an altitude of about 1100m (see photograph to the right) – these are named after climbing routes on the cliffs above them and are known as (from left to right in the photograph) Michaelmas Fare, Sphinx (named after the Sphinx Ridge) and Pinnacles (named after the Pinnacles Buttress). On my visit the Pinnacles snowpatch actually had the remnants of a fourth small snowpatch about a few metres in length next to it. The Sphinx snowpatch is the most persistent snowpatch in the whole of the Scottish mountains. The snow the Sphinx snowpatch consists of has not fully melted since October 2006 (meaning the snow when I visited it was six years old), and has only disappeared completely six times since observations began in the late 19th/early 20th century, in 1933, 1953 (when the Pinnacles snowpatch survived), 1959, 1996, 2003 and 2006, and then only for a short period in the autumn before winter snowfalls arrive. This means that the ground below the Sphinx snowpatch has probably been completely clear of snow for a combined total of only a few months since the start of the cold climate period in the 16-19th centuries known as the Little Ice Age. This is the closest Scotland comes to having a glacier. Below the snowpatches at the foot of the bowl of Garbh Choire Mòr is a feature that has caused much debate in recent years (see photo to the right) – this is a small ridge of boulders and soil that was once thought to be a moraine that may have been modified by glacial ice as recently as the 19th century, thus providing evidence (from lichenometry, pollen analysis and radiocarbon dating) of recent glaciation in the Cairngorms. 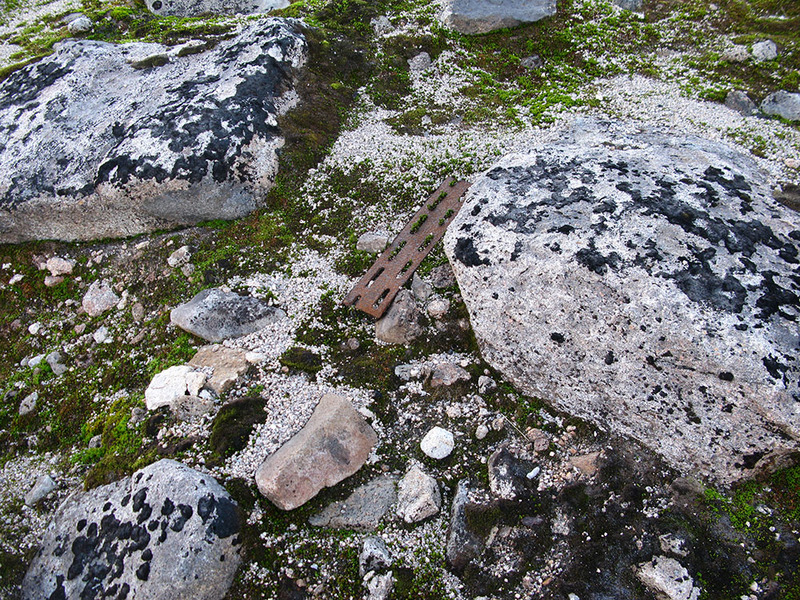 However, current expert opinion is that this feature is a protalus rampart that does not require glacial ice to form, and is probably still being modified in recent times by rockfall from the surrounding cliffs and wind-blown debris from the Braeriach plateau to the west of Garbh Choire Mòr. Glaciers have probably not existed in Garbh Choire Mòr since the end of the last widespread period of mountain glaciation, the Younger Dryas or Loch Lomond Stadial, which ended over 10,000 years ago. However, during the Little Ice Age there was almost certainly a large perennial snowpatch in Garbh Choire Mòr that filled the whole corrie. See my previous blog postings for more information about this, ‘The Scottish mountains: on the glacial ‘knife-edge’ and ‘Scottish glaciers‘, particularly the comments. The appearance of the snow in the Garbh Choire Mòr snowpatches is that of extremely hard and compact ice, and is more accurately described by the term firn. I saw no sign of any melting occurring on my visit, and there was a layer of patchy fresh snow of about 1-2cm thickness from a recent fall in the last week covering the snowpatches (I experienced a shower of snow on the summit of Cairn Gorm on September 19th, four days before my visit to Garbh Choire Mòr, see a photo here). Since my visit, there has been some further snowfall and low temperatures in the Cairngorms, and the three patches will almost certainly survive into next year. 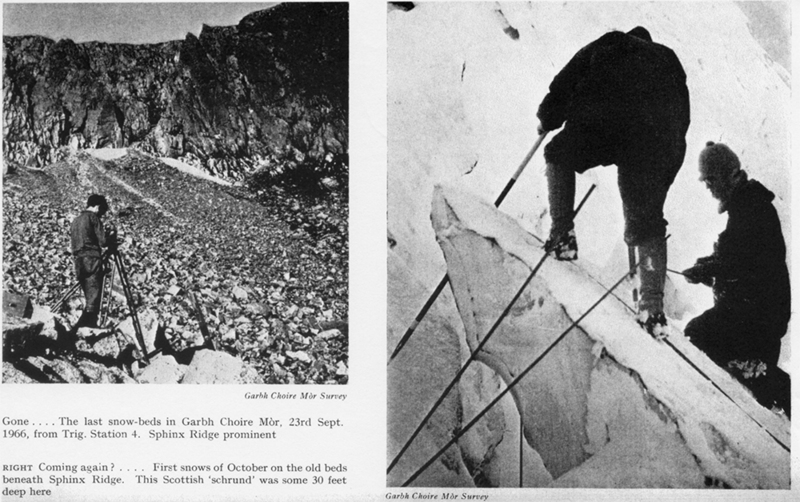 Two photographs which can be seen here, are taken from an article written by W. G. Berry in volume 28 of the Scottish Mountaineering Club Journal from 1967 entitled ‘Salute to Garbh Choire Mòr’, in which the scientific study of the corrie from Oct 1965 to Oct 1966 by Queen’s College, Dundee (now the University of Dundee) is described. The first photograph shows the snowpatches on 23rd Sept 1966 – exactly 46 years, to the day, before my recent visit to the same snowpatches. And what is perhaps surprising is that the appearance of the snowpatches (Michaelmas Fare, Sphinx and Pinnacles all appear to be visible) is very similar to what I saw last month. In 1966 only the Sphinx patch survived, even though lasting snow arrived at the start of October that year (A snow book, northern Scotland by Adam Watson). This lasting snow can be seen in the second photo from 1966. 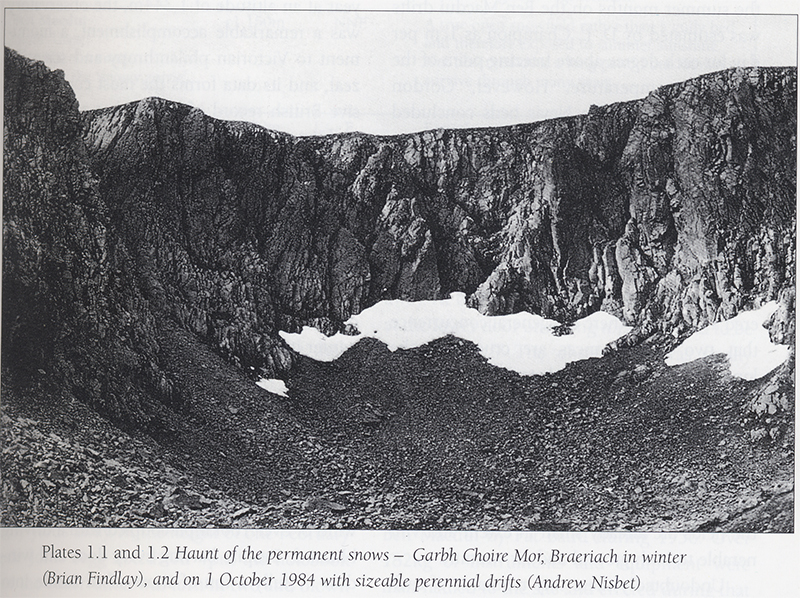 In Adam Watson’s book he also notes that in the 1967 SMC Journal article Berry identifies the protalus rampart feature in Garbh Choire Mòr as an ‘avalanche boulder tongue’, a description that Adam Watson agrees with – so Berry was apparently on the right track in 1967! A snow book, northern Scotland, Adam Watson, Paragon Publishing, 2011, pgs. 34 & 67. Berry W G. 1967. Salute to Garbh Choire Mòr. Scottish Mountaineering Club Journal 28. 273–276. The Pinnacles snowpatch is named after the climb above it, Pinnacles Buttress. The climb is graded Difficult (D; Summer) and III (Winter). The first recorded attempt of the climb was on 20th July 1924 by James Parker and Henry Alexander, who gave the climb its name (and thus the name of the snowpatch as well). The attempt was recorded by Parker in an article in the Cairngorm Club Journal (CCJ) in 1924. The name ‘Pinnacles’ refers to two rock pinnacles at the top of the ridge. The two men walked into Garbh Choire Mòr from Derry Lodge (the same route I took on my trip described in this blog posting) and unusually for July, both men carried ice axes. They encountered a large snowpatch (“a big slope of snow probably about 500ft high set at a steep angle”) in Garbh Choire Mòr, which they climbed to get to the foot of the cliffs, and they used their ice axes to cut steps to allow them to negotiate the ‘bergschrund‘ (which they could not see the bottom of) where the snowpatch met the rocks at the foot of the cliffs. 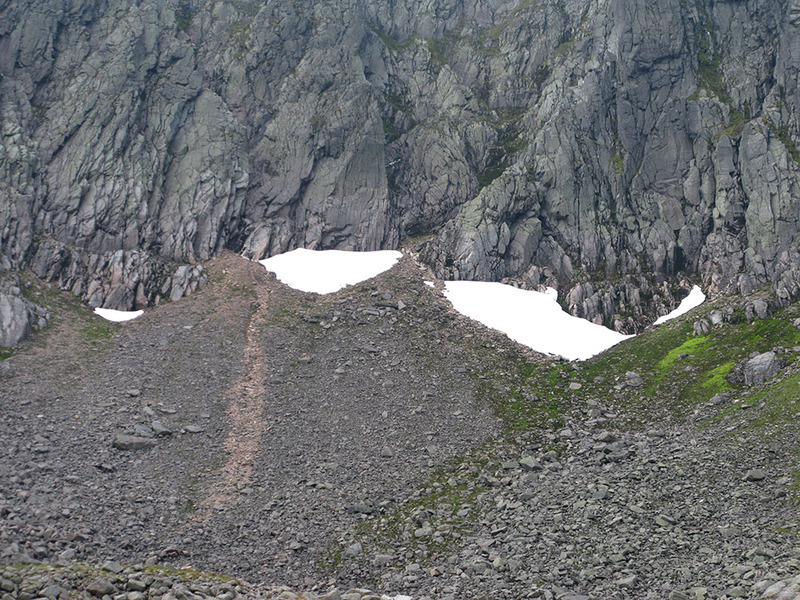 A photograph accompanying the CCJ article shows a single large snowpatch in Garbh Choire Mòr covering the locations of the Pinnacles, Sphinx and Michaelmas Fare patches, which is a large extent for late July. In Cool Britannia by Adam Watson and Iain Cameron this CCJ article photograph is described with the comment “Such a large wreath in late July has been very unusual in recent decades”. This photograph (along with a photograph of the ‘bergschrund’, mentioned above) can be seen here. 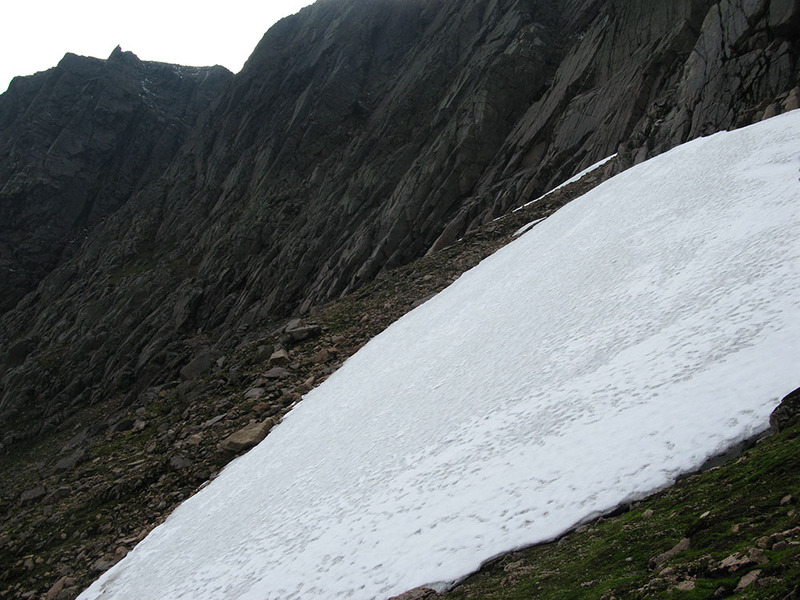 Compare with this photograph of a single large snowpatch in Garbh Choire Mòr taken on 22nd July 2008, which was probably the largest the snowpatch has been in late July in recent times. This photograph of the snowpatch taken on 15th July 2007 shows a similar size for that year also. In 1994, the snowpatch was very large, as can be seen from a photograph here, taken on 7th August 1994, and in 1993, the snowpatch was also very large, although later in the year, as can be seen from this photograph taken on 5th October 1993 (Pottie J. 1995). Strangely, a photograph of the snowpatch which can be seen here taken on 2nd August 1993, earlier that year, shows the patch to be almost identical in extent (and even a little smaller) to October, which is a bit of a mystery. 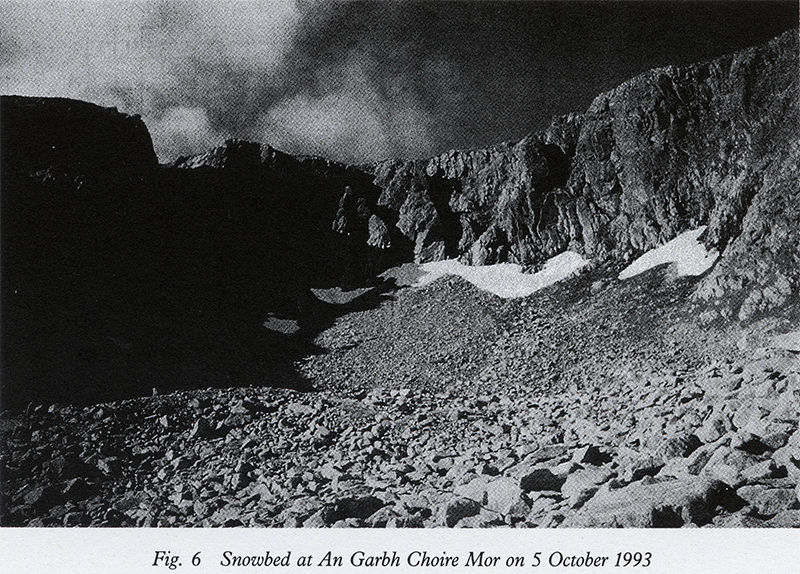 A photograph of the Garbh Choire Mòr snowpatches taken on 1st October 1984 can be seen here (taken from Scotland’s Winter Mountains by Martin Moran). The appearance of the snowpatch in this photograph is almost identical to the one above taken on 5th October 1993, and shows a relatively large extent of snow for so late in the year. In 1974, the snowpatch was comparable in size to 1924, as can be seen in a photograph taken on 25th July 1974 here, and in 1967 the snowpatch was possibly the largest it has ever been recorded on a photograph in summer, and Garbh Choire Mòr and the neighbouring corries had many large summer snowpatches, which can be seen in an astonishing photo here. Parker & Alexander were unsuccessful in climbing the Pinnacles Buttress route on this occasion but they did get to the Braeriach plateau from the snowpatch at the base of the Garbh Choire Mòr cliffs using the easier Pinnacle Gully route to the left of Pinnacles Buttress – this climb is nowadays given the grade of I (Winter). The Pinnacles Buttress route was first successfully climbed in September 1941 by brothers Sandy Tewnion and Sydney Tewnion, and Sandy McArthur. The first climb of Pinnacles Buttress in winter conditions was by John Bower, Raymond Simpson and Greg Strange in April 1968. Sandy Tewnion was injured in the Second World War in 1944 and never climbed again (although he became a keen hillwalker and photographer) and Sydney Tewnion died with three others in a winter storm at new year 1951/52 whilst walking from Corrour Lodge to Benalder Cottage. The Sphinx snowpatch is named after the climb above it, Sphinx Ridge. The climb is graded Very Difficult (VD; Summer) and III (Winter). This feature takes its name from a rock obelisk above the ridge called the Sphinx, which had been named by Bill Hendry in 1941 during an exploration of the cliffs of Garbh Choire Mòr from the plateau above the corrie. The Sphinx Ridge was first climbed by Kenny Winram, George Dey, Mac Smith and Bill Kelly in May 1952. The first climb of Sphinx Ridge in winter conditions was by Jerry Light and John Vigrow in March 1966. 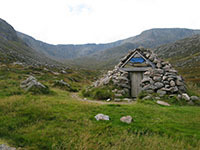 Jerry Light was also responsible for the construction of the Garbh Choire shelter in An Garbh Choire in the summer of 1966. The gully to the right of Sphinx Ridge contains a slightly easier route, Sphinx Gully, that was first climbed by Adam Watson and Patrick Baird in October 1954. This climb is graded II (Winter). Adam Watson records this climb in his book ‘More days from a hill diary, 1951-80 – Scotland, Norway, Newfoundland’. Adam Watson is the foremost expert on snowpatches in the Scottish mountains and has been mentioned many times throughout my blog postings and website. Patrick Baird was a Lieutenant Colonel in the Royal Canadian Artillery (although a scotsman) and a director of the Arctic Institute of North America from 1947 to 1954. In the summer of 1953 he led a scientific expedition to Baffin Island, of which Adam Watson was a part. From 1954 to 1959 Patrick Baird was at the Department of Geography, University of Aberdeen and in the Cairngorm Club Journal Vol. 17 (1957), he writes a report of a weather station near the summit of Ben Macdui that he manned throughout the year of 1956, to monitor meteorological variables and the nearby long-lying snowpatches in the Snowy Corrie (one patch lasted until that winter). Adam Watson records his part in the construction of this weather station in December 1955 in his book ‘More days from a hill diary, 1951-80 – Scotland, Norway, Newfoundland’. 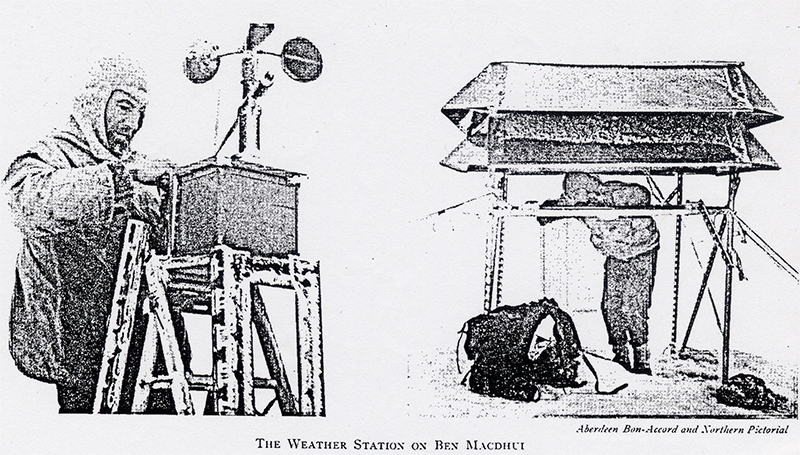 Two photographs which accompany the CCJ article and show the weather station can be seen here. 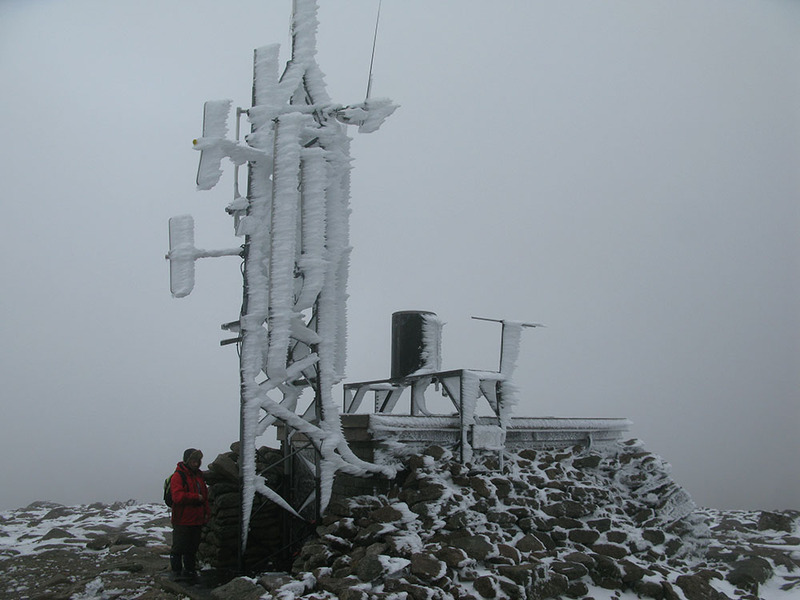 An interesting contemporary postscript to this is that there may be remnants of this weather station remaining on the mountain – a photograph which can be seen here which I took in the Snowy Corrie shows a section of metal that closely resembles some of the components of the station which can be seen in old photos. Patrick Baird died in 1984. An online obituary of Patrick Baird can be found here. The Sphinx Ridge climb is notable in that it is the only rock climb in the British Isles which always requires the traverse of a snowfield (the Sphinx snowpatch) to get to the base of, at all times of the year and in all seasons. The climb also gets harder as the year progresses and the Sphinx snowpatch decreases in depth and length, as it reveals more of a very steep and smooth rockface at the start of the climb as it recedes from the rock. The summer grade of the climb was originally given the unusual grade of ‘Very Difficult up to July’ for this reason – presumably there is a case for the route meriting the more difficult grade of ‘Hard Very Difficult’ (HVD) or ‘Mild Severe’ (MS) later in the season. In A snow book, northern Scotland by Adam Watson, it says about the base of this climb: “graded as Severe by Fyffe & Nisbet” (pg. 38), although I was unable to find this in the 1995 edition of Cairngorms Rock and Ice Climbs by Fyffe & Nisbet. Baird P D. 1957. Weather and snow on Ben Macdhui. Cairngorm Club Journal 17. 147-149. The Michaelmas Fare snowpatch is named after the climb above it. ‘Michaelmas Fare’ refers to a short route going up a ridge to the right of the more well-known Bunting’s Gully route in Garbh Choire Mòr. The Michaelmas Fare climb is graded Very Difficult (VD; Summer) and III (Winter). Interesting stuff! Do you have any more pictures of Garbh Choire and the snowpatches? I’d like to see them. I read about the 1951 Corrour tragedy….extraordinary to think that experienced climbers could die so close (within a km or 2) to shelter. I guess now we would just crawl into our goretex bivvi bags and try and wait the worst out. I was caught in a strom when ice climbing in the Northern Corries. Even though the wind was behind us, and even though we were going downhill, a combination of storm winds and deep snow pretty well exhausted me. Scary! Thanks Eddie. Great pictures….can’t wait to get back up to the Cairngorms again to have a look around. I finally got around to reading Kellan MacInnes’ book Calebs List, that he mentions in his comment above from October 2012. Cash C G. 1895. Cairn Toul in August. Cairngorm Club Journal 1 (no. 5). 336-337. As far as I am aware, this is one of only two references (see below for the other one) that Cash ever made in writing to snowpatches in ‘Garbh Choire’, this being the enormous gulf between Braeriach and Cairn Toul, also called An Garbh Choire on modern maps. 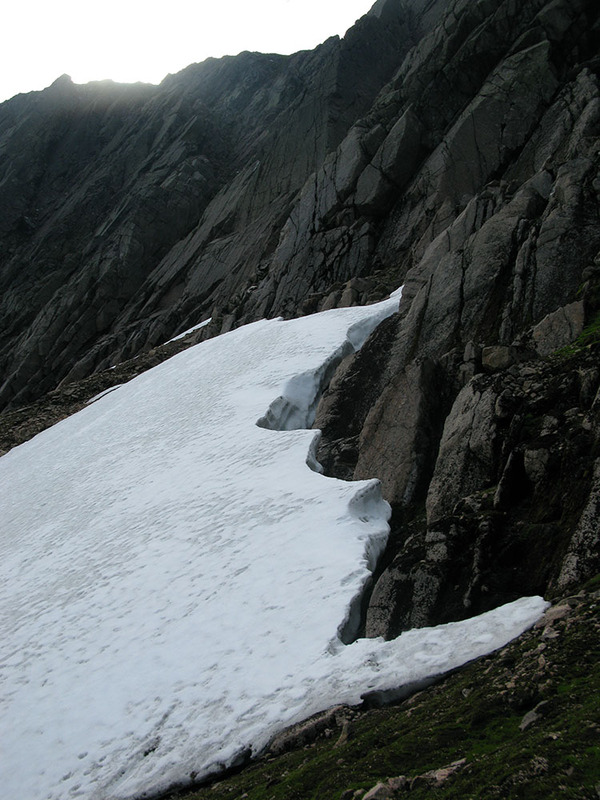 The persistent snowpatches described in this blog posting lie in the smaller Garbh Choire Mòr which comprises the westernmost end of An Garbh Choire, and it’s not clear from this quote if Cash is referring to the Garbh Choire Mòr snowpatches. My current understanding of Cash’s published writings is that Cash never actually described, visited or recorded Garbh Choire Mòr itself specifically, or the long-lasting snowpatches that lie in it (now known as Michaelmas Fare, Sphinx and Pinnacles), always observing the larger An Garbh Choire as a whole from the Braeriach-Cairn Toul plateau above. 1. Cash C G. 1902. Nights and days on the Cairngorms. Cairngorm Club Journal 3 (no. 18). 317-326. Strangely, there is no mention in this article of the snowpatches in Garbh Choire Mòr to the south of the Braeriach plateau, despite the summit of Ben Macdui being a good location to observe them from, and despite there almost certainly being snowpatches there to observe (perhaps visibility was poor). 2. Cash C G. 1905. Three visits to the Garbh Choire. Cairngorm Club Journal 4 (no. 24). 337-349. ‘Lochan’ probably refers to Sgòr an Lochain Uaine. 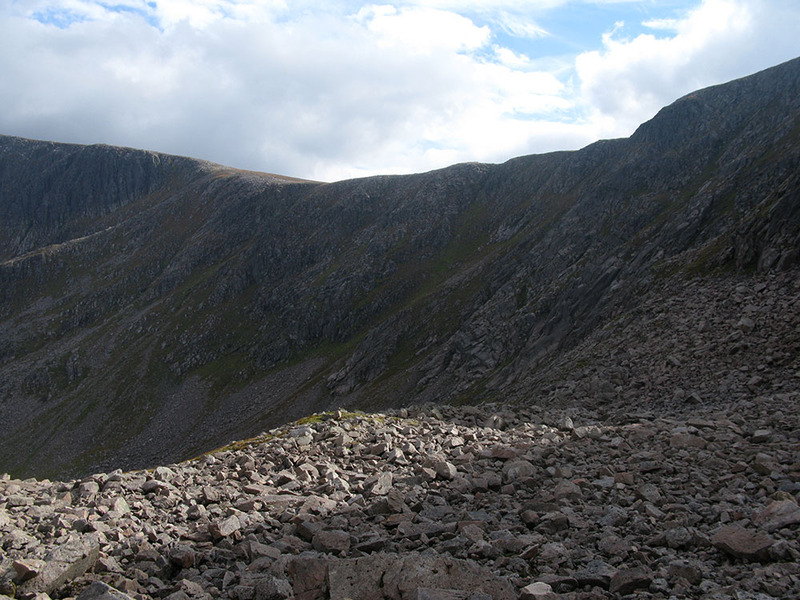 The location of this gully is uncertain but appears to be what is now known as the Corrie of the Chokestone Gully, about 1km to the south-east of the location of the long-lasting snowpatches in Garbh Choire Mòr. The snow that Cash mentions in this quote appears to lie at the top of this gully, which is unusual in recent years for early August, although a snowpatch at the top of this gully is visible in this photograph taken in August 1994. 3. Cash C G. 1908. Some early notices of the Avon and upper deeside. Cairngorm Club Journal 6 (no. 31). 18-24. This article contains no references to the Garbh Uisge Mòr or snowpatches. The same volume of the CCJ (no. 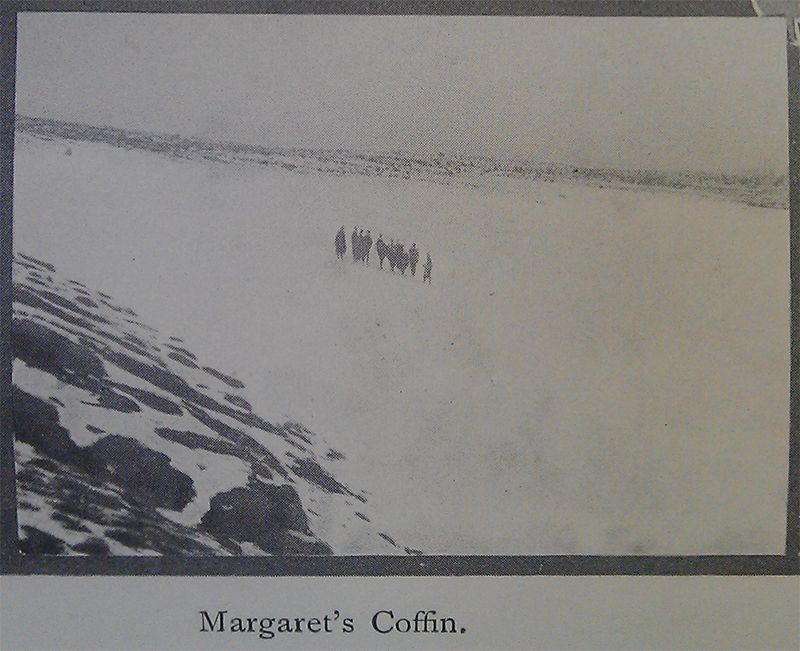 33 from July 1909) does however contain a plate after page 144 (unrelated to Cash’s article) with 4 photographs labelled ‘Cairngorm 26th June 1909′, and one of these photographs is quite interesting as it shows the snowpatch in ‘Margaret’s Coffin’ (Ciste Mhearad) – this photograph (unfortunately of poor quality) can be seen here. I believe this photograph is the earliest in existence of one of the long-lasting snowpatches in the Cairngorms and only some photos of the snowpatches on Ben Nevis taken in September 1905 are older (Gatty V H. 1906. The Glacial Aspect of Ben Nevis. The Geographical Journal 27. 487-492). 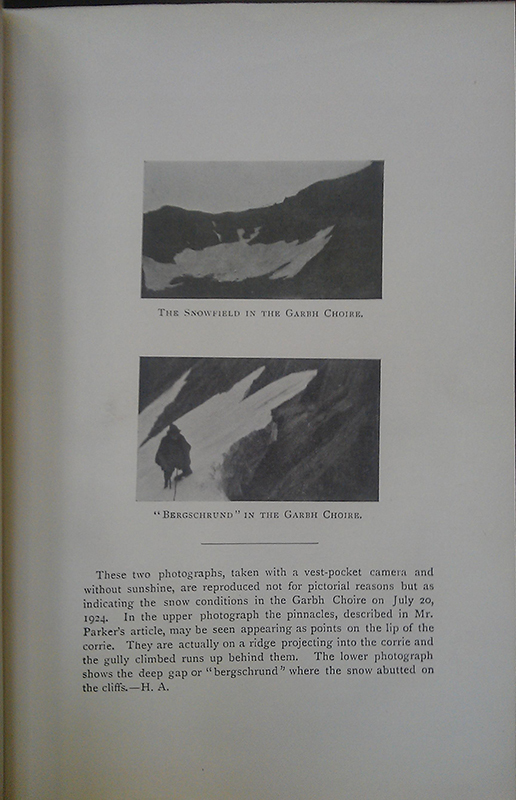 The oldest photograph of the snowpatches in Garbh Choire Mòr is (I believe) Seton Gordon’s photograph of the Pinnacles snowpatch in October 1910 which can be seen here, and is in Adam Watson’s collection. We’ve just published a short paper on the corries (http://hol.sagepub.com/content/early/2013/12/23/0959683613516170.abstract) in which we used and acknowledged a couple of your photos that you kindly sent me. I hope you find the paper interesting. I’ll send a pdf soon. 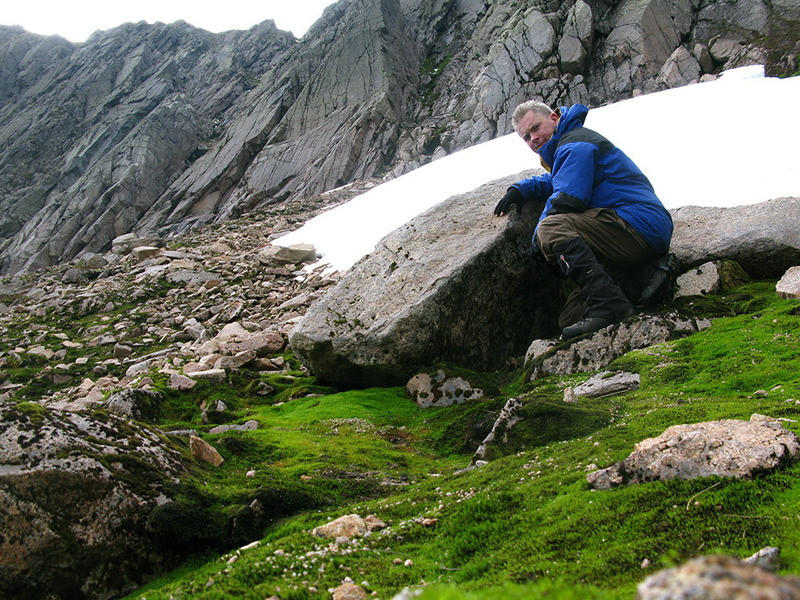 Seems that Little Ice Age glaciers did exist in the Cairngorms! Actually in the past few years there has been more snow than the Met Office predicted, and in Feb 2014 massive amount fell at locations above 2000 feet. The climate will change again, and a recent swing last week, saw snowdrifts up to 80 Feet Deep on Cairngorm Mountain, and drifts of similar sizes in Glenshee, Glencoe, and The Ben Nevis Range. On many Scottish slopes, chairlift and tow pylons were almost completely covered, and in a few places, drifts were so high that they touched the blades of Wind Turbines. This may be unusual.but seems like part of an increasing downward trend in temperature, even whilst CO2 continues to rise steadily. There has been a standstill in temperatures fo around 15-17 tears, depending on whose figures you look at, but even the Met Office admits this. A growing hypothesis even suggests that a long overdue “Maunder Type” minimum may already be upon us, and temperatures will fall even further beyond that which you suggest may be required for Scottish Glaciers to start reformation. Indeed in the Coire at Cairngorm a permanent snowfield is beginning to emerge it seems, and similarly in the Nevis Range Mountains of Lochaber. See the video selection at the Fraudulent Climate of Hokum Science, and especially the Weather Page which is linked to my moniker (Click it above). Controversy exposes the Bull$h’t and like Fox News, We Show you the evidence, and then YOU Decide. These videos may disturb and shock you, be warned. Thanks for reading thus far. I’m afraid that most of what you have written is wrong. There hasn’t been a downward trend in climate recently. The warmest years in the instrumental record are: 2010, 2005, 2007 and then 1998. Even a quiet sun would not overwhelm the radiative forcing associated with Greenhouse Gases. Don’t forget that a warmer climate holds more moisture. heavy snowfall in one small part of the globe tells us nothing about global climate.